Since automobiles were invented, racing has been associated with cars for over 100 years. Humanity has pushed cars to their limits and broken those limits to find more speed. After all, the whole point of racing is to be the first one to cross the finish line. We dream of the ideal perfect race weekend. 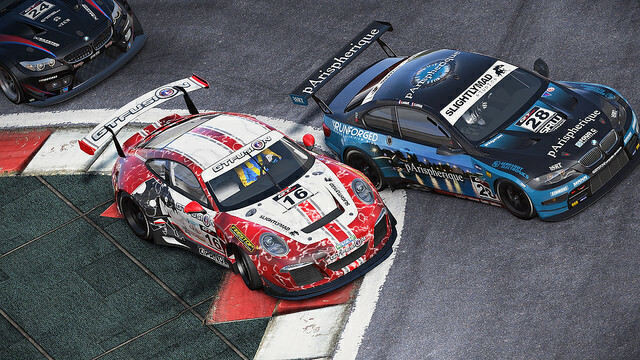 Slightly Mad Studios offers Project CARS for racing fans who want to create a realistic race weekend with practice, qualifying and, of course, race day. Does Project CARS offer a realistic race weekend and stand out from the competition? Going down the straightaway three wide is fun. Project CARS stands for Project Community Assisted Racing Simulator. The game was supported through crowdfunding. Unlike most crowdfunded projects, the game was not funded through Kickstarter. Slightly Mad Studios took an alternate approach and created the World of Mass Development portal. 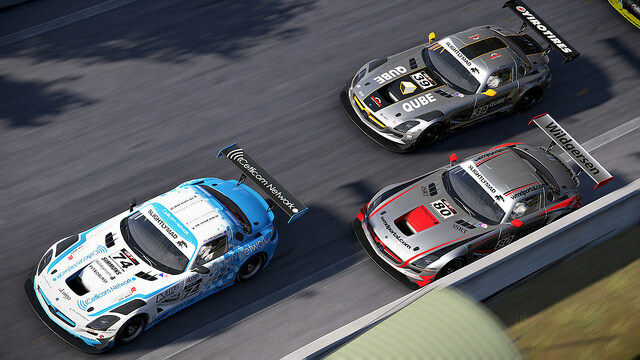 The game was funded and developed by the simulation racing community. Through the use of tool packs, the community was able to play builds, read and discuss game-related topics on forums and post feedback. Drift your say around the corners. The graphics are lavished with details on both the cars and the race tracks. Neither the cars nor the racetracks look blocky or blurry. The only issue I had with the graphics was the background audience. I noticed some of the faces looked awful when I saw them up close near the track wall, but, otherwise, it is clean and polished. There isn’t much of a soundtrack in the game and it can primarily be found in the menus. I don’t consider this a bad thing as the sounds you will hear are the roars of the cars themselves. Having music during the race would have ruined the authenticity and realism of a race weekend, and I am thankful Slightly Mad Studios chose to keep the music in the menu. Sure, none of the music or sounds are memorable or catchy, but it gets the job done. 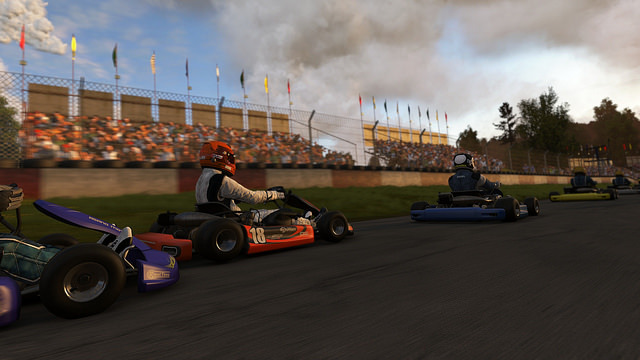 Slightly Mad Studios’s goal is to make Project CARS the most realistic racing simulator. 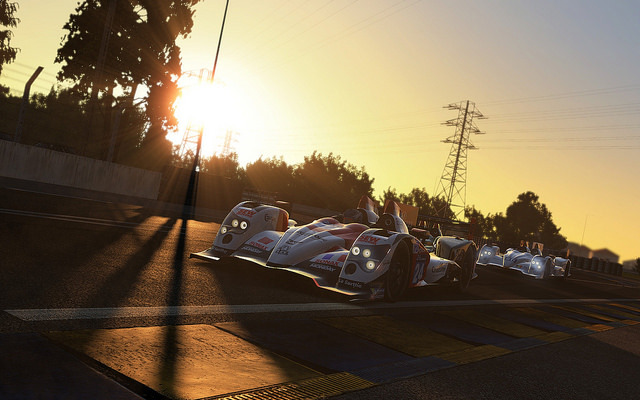 Unlike the competition, Project CARS lets you race in any track and in any in-game vehicle. There is no need to unlock any content as it is given to the player from the very beginning. There are different tracks based on both real world tracks and fictional tracks in real world locales. 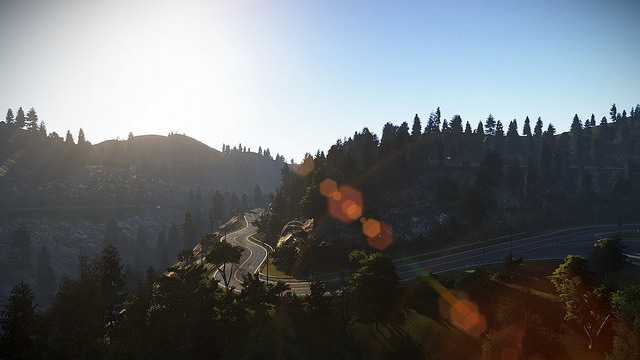 The game includes licensed tracks such as Watkins Glen, Road America and Sonoma. There are several vehicle classes to choose in the game. Some examples include Karts, GT, Indy/Formula, Vintage Stock Cars and Road classes. The variety is appealing and it gives everyone a chance to master all the vehicles. All the cars handle differently. Some cars tend to be tight while other cars are loose and are more likely to spin out or hit the wall if one does not drive carefully. As with any simulation racer, the cars will have to be adjusted in the garage. In the garage, players can create custom setups for all vehicles and save them for specific tracks or for all tracks. The tire pressure, bar, ride height, down force, brakes and springs can be adjusted. Players who are looking to race in ovals are going to be disappointed to find out there are no oval tracks in the game. Every track is a road course with various lengths and turns. The key is to drift around the corners, shift your gears quickly and take advantage of passing lanes. Test your open wheel skills. There are several different modes to experience during the game. There is a single player campaign. Career Mode is set up with seasons and championships to be won. 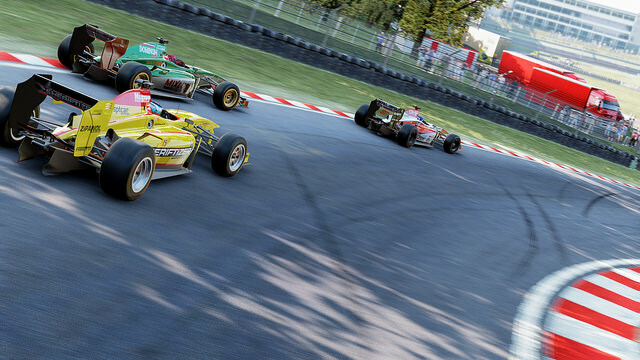 Players are able to race in eight different tiers and can choose to start in any tier they desire. As an initiative, there are historic goals to obtain. Every race weekend has a practice session, qualifying and the race. Each race takes place in simulated real time. Each practice, qualifying session and race will not end until both the player and the AI have finished the event or time is up. If any race session is a bad day, quitting early will force players to watch the rest of the race until all the AI opponents are done. Speaking of the AI, it is no pushover. The AI will test your skills and challenge your racing skills by clogging up the passing lanes and blocking opponents at every chance. Running into the AI is not wise because they are giant moving bricks. Crashing into the AI will have you stuck and make it difficult to steer the car back on the track. Online Multiplayer is available as an avenue to test out your racing skills against the world. Unlike conventional online lobbies, one does not select a mode and wait for a match to begin. Players must either create their own online session or pick from a list of sessions. Players can search for online matches by location, event length, class and skill level. Be aware that each online match has its own special rules and conditions. Every online match will be different from the previous match, as the conditions are preset before players join the match. Players who want to play through a single race can make their own quick race weekend. This mode allows players to race at any track with any cars. Weather conditions can be set, and players can choose to have practice, qualifying and the race or just have the race. Project CARS also has daily community events. You can check out their social media pages and their official website to find details on current and upcoming events. Driver Network Community events give players a chance to compete in racing specific challenges against the world for the best times. There are also leaderboards and a time trial mode. Even go-kart racing is intense. Project CARS has three different control schemes. First, there is the traditional keyboard and mouse controls. I do not recommend using this for the game, though, as it was not designed to make tight turns. Project CARS was designed and optimized for Steering Wheel controls. The game is compatible with a laundry list of steering wheel products. You will have to look and see if your particular steering wheel has its own control setup menu. If a steering wheel is outside of your budget, using a controller is the best alternative and is the control method I used during the game. The PC version is by default optimized for the Xbox One Controller. It is the quickest and most convenient option, but the game allows players to use a custom controller and map their own control layout. Just be sure there are enough buttons to map out all the controls. The controls are easy to use, but hard to master. Adjusting the controls is as simple as adjusting steering and brake sensitivity and turning on or off driving assistance. The controls will have to be adjusted multiple times to suit both your control scheme and your driving style. Take advantage of all passing opportunities. 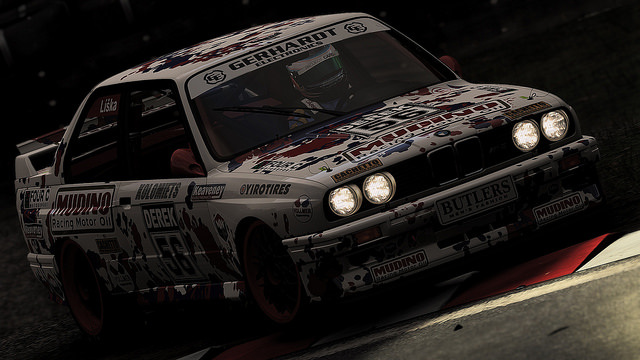 One of the great features of Project CARS is the option to tweak your racing settings. The game lets players have as realistic of a race weekend as they desire. If you want a race weekend with all flags and penalties enforced with an aggressive AI, tire wear and damage to the cars, the settings are there. If your style is to turn off penalties, forgo practice and qualifying and decrease the AI difficulty, the option is there, as well. The freedom to create your own race weekend without the hassle of unlocking content makes Project CARS one of the most accessible simulation racers while appealing to sim racing fans. Drive through the beautiful sunset. 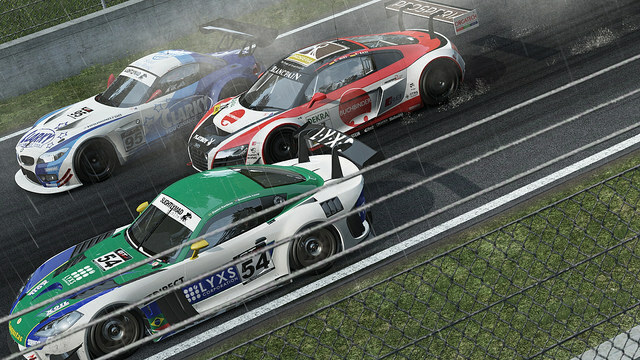 Project CARS offers a simulated racing experience. With custom race weekends, community events, a worthy single player mode, online multiplayer, and a ton of content unlocked from the beginning, the game offers value for those who are committed to the game long term. It separates itself from the competition by letting players experience the game through their own accord. In the future, there will be upcoming DLC for the game. The biggest challenge is mastering the controls and adjusting them to your control scheme and driving style. While the controls could have used more polish, there are plenty of options for everyone. Project CARS is a game for the simulation racing community made by the simulation racing community. Do you have what it takes to race for 24 hours? Review code provided by publisher and is based on seven hours of gameplay.